For reasons that are too weird to mention, our family, due largely to being egged on by our son-in-law, has made an annual event of watching the annual Coney Island Nathan’s hot dog eating contest. Our family hero, of course, is perennial winner Joey Chestnut, whose current record is something like 72 hot dogs and buns (about 16 pounds worth) in 10 minutes. With the Fourth of July bearing down on us, the anticipation of watching the next contest is almost too much for us to bear. What does this have to do with an overnight stop Amarillo? Amarillo is the home to the “Big Texas Steakhouse,” which offers a “free” 72-oz steak meal to anyone who can finish the entire meal in less than one hour. The meal consists of a shrimp cocktail, baked potato, salad, roll with butter, and of course the 72 oz. steak. Finish all that in one hour and it’s free. Miss the time limit and you get whacked for $72. Putting two and two together, you’re no doubt wondering, what would Joey Chestnut do to the steak meal? You guessed it. He holds the world record for finishing the meal: 8 minutes, 52 seconds. If you can watch him do that without upchucking your cookies, there’s a YouTube video online. Just think. But for this trip, I would have gone to my grave unaware of such truths. This entry was posted in Travels on June 17, 2018 by skiprd. We leave Atlanta and make a beeline for Palmdale, California, for a couple days visiting my sister and her husband. That marks the beginning of almost two weeks in California, which raises a weird political thing about our travels. I noted previously that our trips around the country rarely bring us into contact with the leftish fraction the political spectrum. Part of that, of course, is because gauche cohort tends to congregate in cities, where there are obviously few scenic opportunities. But one might wonder, does California present an exception to the curiosity that we find only the red areas of the country are worth traveling to? Nope. Even in a choke-hold-blue state like California, with blueness extending its grip even to the rural and agricultural areas, our particular destinations seem to be only of reddish persuasion. (And that includes Palmdale, which although technically in Los Angeles County, and which is a stop only for personal, not scenic, reasons, is politically and culturally part of Kern County, the massive red trapezoid to its north.) Surprisingly, the entire coastline of California, which is an uninterrupted string of blue bastions, has only one red exception, Del Norte County, which is where we happen to be staying. 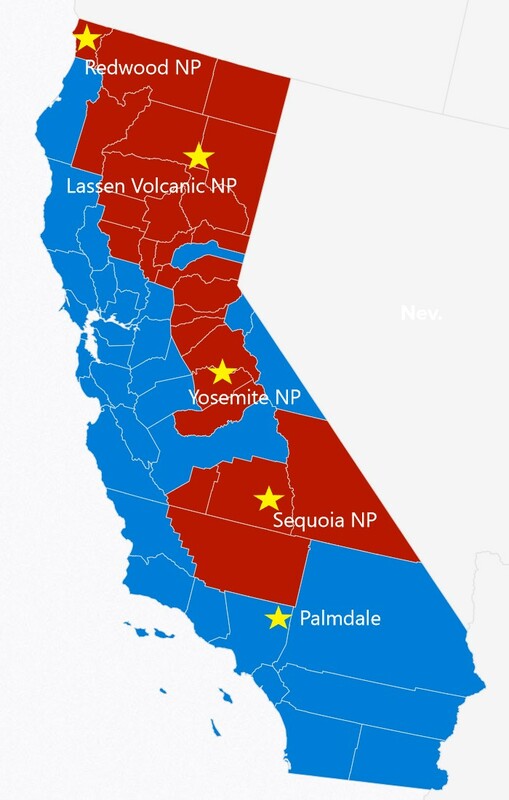 It looks like we’ll be able to transit almost the entire length of California with nary a contact with any blue people. Weird. I wonder if there’s a point to all this? Anyway, where was I? 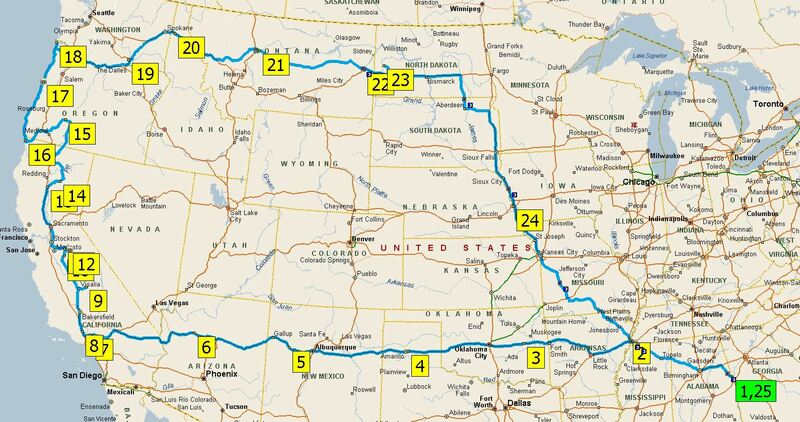 Oh yeah… trip plans. We depart from Georgia on Wednesday, June 13, arriving in Palmdale on the following Monday. From there, it’s off to Sequoia and Kings Canyon National Parks, Yosemite National Park, and Lassen Volcanic National Park. Then, a quick blip up to Crater Lake National Park where we link up with Robert and his family in their brand new RV. I wrote previously of delivering Robert’s pop-up camper to him. Given their affinity for camping, though, and more importantly given the inevitable nature of traveling with three little dirt-bag boys, they decided that it would be beneficial to have an RV with a bathroom where one can hose off the little rascals. So they are now the proud owners of an Aspen Trail 2340 travel trailer, which gives them not only the aforementioned hosing-off-chamber, but bunk beds and other creature comforts. All of us will then caravan over to Redwood National Park for a couple days, then up the Oregon coast, stopping first in Newport and then Astoria, before we split off and they had back to Dupont and we head east, working our way over several days to Theodore Roosevelt National Park in North Dakota. That last stop holds special appeal: Teddy Roosevelt was, in many ways, the godfather of the conservation movement in America. The irony is that his conservation ethic was forged by the economic and environmental calamities his ranches suffered in the 1880s. The area of those ranches, and how they offer a special glimpse into Roosevelt’s core values, is where we’ll spend a few days. We are really looking forward to that stop. Then, it’s working our way back home, and we should be back mid-July. We’ll clean up for a week or so, and then gird our loins for having five little granddaughters stay with us for a week. This entry was posted in Travels on June 10, 2018 by skiprd. The campground here (Mayberry Campground) (because it’s near Mt. Airy, which was the model for the town of Mayberry in the old Andy Griffith show) (which is a story in itself, but one I can’t mess with right now) sits on the historic property of Chang and Eng Bunker, the original Siamese twins, and is run by descendants of the Bunkers. The story of the Bunkers is so improbable that, if it weren’t true, one would brush it off as a ridiculous fairy tale. 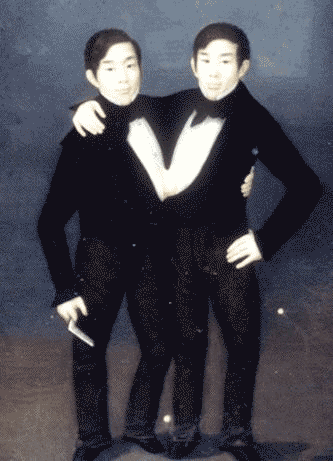 Chang and Eng, from a watercolor done in 1836. Chang and Eng were born in May 1811 in Thailand (then known as Siam). Now known as “conjoined” twins, they were joined at the sternum and shared a common liver, although they were otherwise complete. Conjoined twins occur when, in the early stages of development, an embryo that would otherwise separate to form twins only partially separates. Conjoined twins are rare, occurring in about one out of every 200,000 live births. 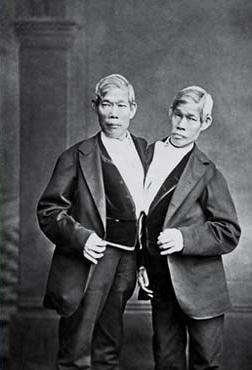 Surgical teams are increasingly capable of separating many such pairs, but in the era of Chang and Eng, separation would have resulted in certain death for both. For a while, Chang and Eng were under contract to a company that paraded them around the United States as a curiosity, but after that contract expired they settled in North Carolina where they bought a farm. [NOTE to all readers under the age of 30. Because this story occurs in the early 19th century, Chang and Eng operated their farm using slaves. For you, that makes them morally repulsive and unworthy of anyone knowing anything about them. Accordingly, to protect your fragile psyches, you are encouraged to stop reading now.] North Carolina was a slave state but under U.S. law, the twins counted as white. [Young people: don’t ever go to North Carolina.] They sought and were granted U.S. citizenship, but when they got to the naturalization office and were told that U.S. law required them to have a surname, so they adopted the name ‘Bunker’ from the man standing behind them in line. In 1843, Chang and Eng married two local sisters, Adelaide and Sarah Yates. Originally, the two couples lived in a single home, sleeping in a bed made for four (strange-but-true fact #1) (imagine sleeping like that) (as one example, how did they roll over? ), but after a period of time the two sisters began to dislike each other (#2). So, the two couples arranged to live in two separate homes, with Chang and Eng alternating between the two homes (#3), thereby allowing the sisters to minimize their contact with each other. Over the course of the following years, Chang and Adelaide had eleven children and Eng and Sarah had ten (#4) (the strange aspect of the fathering-children-thing is self-evident). Chang’s son Christopher and Eng’s son Stephen both served in the Confederate army, where they were wounded and captured by Union troops. [Young people: I told you to stop reading; don’t blame me if you just learned that there was a civil war.] As a result of the war the two brothers lost almost everything. In 1870, as they were returning from a tour of Europe and Russia, Chang suffered a stroke down the side closest to his brother. Eng nursed him as best he could, carrying around Chang’s now useless leg in a sling as his ailing brother leaned on a crutch. Shortly thereafter, Chang began drinking heavily (which did not affect Eng, because the two brothers did not share a circulatory system) (#5) (imagine being joined at the chest to a tipsy brother) and in 1874 Chang died while the brothers were asleep. Eng awoke to find his brother dead, exclaimed “Then I am going!” (#6) and died a few hours later (#7) (imagine being joined to a corpse, and having to wait a few hours for the inevitable). And if all of that isn’t enough, the Bunkers’ shared liver was removed and can be seen in Philadelphia’s Mütter Museum to this day (#8). Chang and Eng in their later years. The Bunker dynasty, however, lives on. There are more than 1500 descendants of the Bunkers, many of whom live in the Mt. Airy area, and several of whom are prominent in their fields. United States Air Force Major General Caleb V. Haynes was a grandson of Chang Bunker through his daughter Margaret Elizabeth “Lizzie” Bunker. Alex Sink, former Chief Financial Officer of Florida, is a great-granddaughter of Chang Bunker and was the Democratic nominee in the 2010 Florida gubernatorial election. Eng’s grandson through his daughter Rosella, George F. Ashby, was President of the Union Pacific Railroad in the 1940s. Composer Caroline Shaw is a great-great-granddaughter of Chang Bunker and won the Pulitzer Prize for Music in 2013. My radio club was treated to a tour of the white farmhouse on the campground property built by Eng’s son, William Bunker, in 1900. The campground owner, Benny East, is the great-great grandson of Eng. His mother, Ruby Bunker East, was born and raised in the farmhouse along with her 5 sisters. Benny’s daughters, Kali and Lakin East can also be found working at the campground and are great-great-great granddaughters of Eng. Now … back to the actual point of this post. How did the shakedown cruise go? Fine. 2018 Summer Tour. Stops 15-18 indicate places we’ll be camping with Robert, Laura, and the three boys. That’s it for now. Further details on the upcoming trip will follow. This entry was posted in Ham Radio, Travels on May 30, 2018 by skiprd. After leaving Grand Canyon National Park, the plan was we’d make a quick stop to see Petrified Forest National Park, bip on down the road to see Susan and Terry at their mountain place in Pine Top, and then head home. As we were driving through a construction zone, though, a passing truck kicked up a rock, which hit the windshield, knocked a nasty hole in the top, and created two cracks running down the windshield. Such things are quite common actually, just the necessary consequence of pushing a piece of glass that’s four feet high and eight feet wide down the highway at freeway speeds. It’s actually more common on an Alaska trip, but since Arizona roads seem slightly worse than the Alaska Highway, I expect broken windshields are a fact of life here too. In any event, the windshield repair place, as it turns out, was in the same town as our stop anyway. Woo hoo. See some rockish wood, get the windshield fixed, take a breather up in the mountains, and then point ourselves east, pedal-to-the-metal, and away we go. Petrified Forest National Park was interesting. Actually it was fascinating. 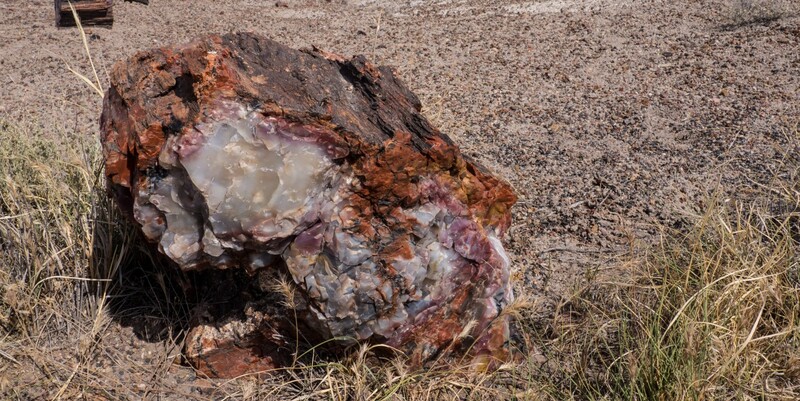 But having spent a month being blown away by sights of breathtaking beauty and drama, we’re a pretty tough audience and petrified wood, even if otherwise worth seeing, just wasn’t up to our current show-us-what-you-got standard. Millions of years ago, this area was a dense pine forest. Of course, it was also down somewhere near Costa Rica and the African continent hadn’t broken off from South America, and the whole planet was basically confused and disoriented, so having a pine forest here is the least weird thing about the geological history of this place. Anyway, as the trees died and fell over, mineral-rich groundwater permeated the logs and the logs’ tissue got turned to rock. If you look closely, you can see that this portion of “Blue Mesa” is littered with petrified wood. Scientists say that the reason the ancient Indians disappeared from this area is a big mystery. Good grief. Look at the rock! It’s obvious that aliens came down to the planet, made a bunch of hand gestures that probably mean “We Serve Mankind,” did a twirly dance thing, and then took them all off to Mars. So much for that mystery. 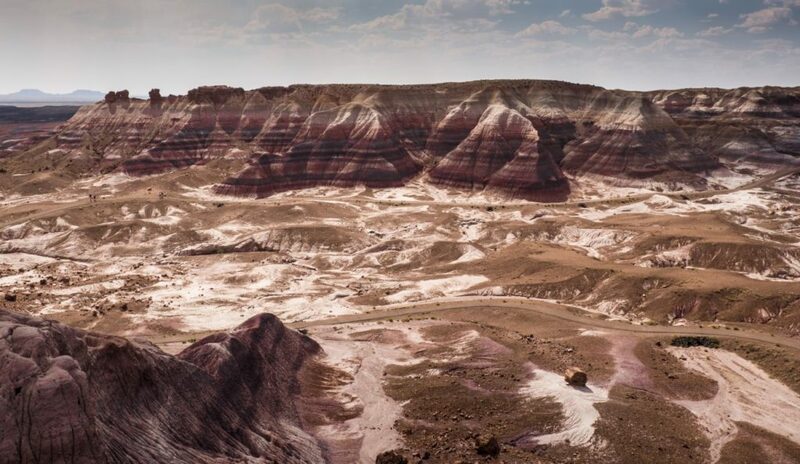 And the top of the park is the “Painted Desert,” although given our current demands for dramatic scenery, we just pretty much drove through it. So, after that, we spent a great day up in the mountains, had another wonderful Mexican dinner, and it’s time to head home. The new windshield didn’t come in, but the glass people said it’s safe to drive as-is, so we’ve decided to drive home with a crack in it and we’ll get it fixed later. When Wendy and I got married, we resolved that someday we’d travel around the country and our first stop would be Grand Canyon National Park. Things didn’t quite work out that way, and it took us way longer to get going on our travels than we planned, but we’re finally well into fulfilling that dream. It’ll be nice to be home, but we are so grateful for a trip like this. Over a dozen national parks and monuments, including places we always said we’d figure out a way to visit someday. And without a doubt, some of best examples of the incomprehensible beauty and grandeur of God’s creation. What a trip! This entry was posted in Travels on June 7, 2017 by skiprd. Before we arrived here at Grand Canyon National Park, we were wondering whether the park may end up being something of a let down. After all, we’d spent the past few weeks in areas of deep, richly colored canyons, spectacular forms of erosion, and towering buttes and arches. 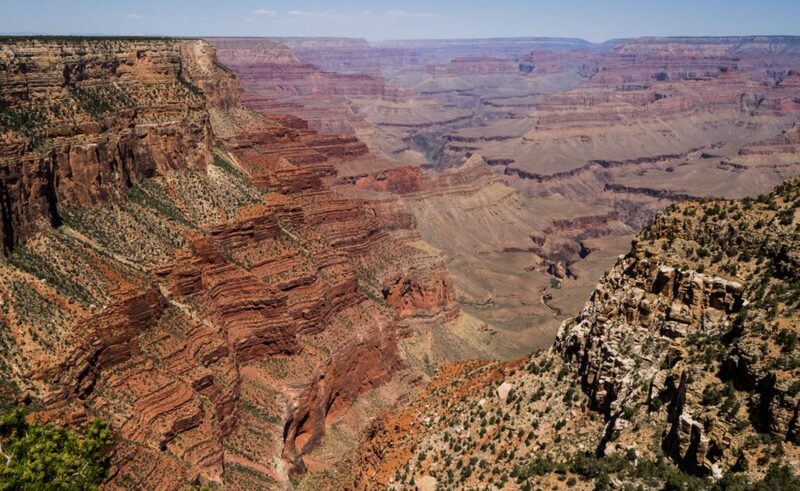 Could the Grand Canyon really measure up to all that? We weren’t sure. Well, the Grand Canyon measured up just fine, but oddly it took us three days here to realize that. We arrived on day one too late to hit the Visitor Center, so the second day we did our usual thing: checked in, spoke to the rangers, watched the official film, got the hiking and touring information, and mapped out a plan, which began with hitting Mather Point, right next to the visitor center, and then hopping in the car to see the classic overlooks along the eastern half of the park. Bleh. It was pretty hazy, which didn’t help, but the views were basically of a plateau that obviously had deep canyons running through it, but the canyon walls disappeared mostly without revealing their depths and the Colorado River, if it was visible at all (which it usually wasn’t) was just a thin, barely discernable blue line. The colors were muted by the haze and the dramatic, breath-taking vistas we expected basically weren’t. And plus, it was crowded. 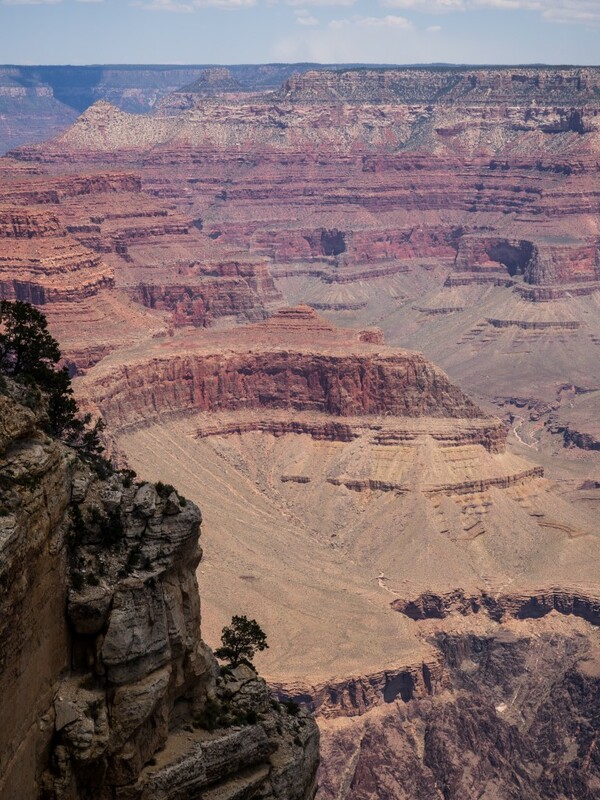 The view from Mather Point near the Visitor Center. If you click on this photo you can barely make out the Colorado River in the upper right-hand corner. It’s that teensy blue thing. So this scene is sort of interesting, but breathtaking it wasn’t. And at each overlook, the effect was the same: our breath remained safely untaken. Plus, as we traveled from viewpoint to viewpoint, each of the views was basically identical. Some of them supposedly featured oddly-named spires and buttes (like the “Temple of Vishnu” and the “Isis Temple”), but there was little to distinguish one from the other, they mostly were blurred by the haze, and there was no guide to pick them out anyway. Definitely more bleh. Maybe, we thought, things would be more impressive under better light, so we packed up a picnic dinner and headed to one of the recommended overlooks to photograph the sunset. Bleh. The next morning I got up at 3:00 and headed over to a different overlook to photograph a sunrise. More bleh. Later that day, we drove down to the National Geographic visitor center in Tusayan to see the IMAX film on the Grand Canyon. That showed what we expected: incomprehensibly deep canyons, dramatic colors, raging rapids, and dramatic sunsets. The problem was that none of that matched what we were seeing in person. We felt like we were running out of time and we were wondering whether our best memories of the Grand Canyon would be of an IMAX movie we saw ten miles away. Then, on the night of our second day, things began to change. Once again we headed over to watch the sunset, but this time the light started to cooperate. Things were still hazy, but the colors of the canyons started to reveal themselves in the light of the setting sun, and the drama of the canyons was, if anything, accentuated in the muted perspective of the evening haze. And then things went from bleh to wow on the third day. Somewhat encouraged by the sunset of the preceding night, we decided to give the Grand Canyon one more chance (pretty big of us, eh?) and we took the shuttle bus up to Hermit’s Rest. And then, based on another one of Wendy’s hunches [someone should figure out a way to bottle her intuitions], we decided not to exit the bus at each of the overlooks as we had planned but instead to walk down from Hermit’s Rest seven miles along the Rim Trail back to the starting point. So we bought a couple sandwiches and some drinks in the Hermit’s Rest snack shop and started walking. And there, along the trail, we found the Grand Canyon everyone kept talking about. A typical view along the Rim Trail, this one only a short way down from Hermit’s Rest. The black-colored rock layers at the bottom of the canyon are, believe it or not, almost as old as the earth itself, nearly two billion years old! Then each of the canyon’s layers rising upward represents hundreds of millions of years of geological history. It’s almost as if one is looking over God’s shoulder as he’s forming the earth over billions of years, getting to watch him as his creation unfolds. Still along the Rim Trail. As seen here, in places the canyon walls were so red that they appeared artificially colored. Layer upon layer of differently colored rock, plunging down about a mile into bottomless canyons. 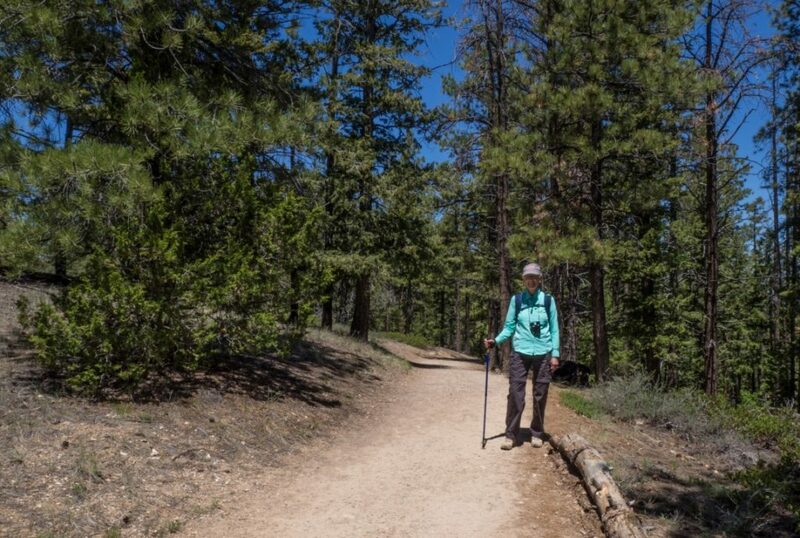 The upper portion of the Rim Trail is paved and accessible to bicyclists, which makes it less desirable to hikers like us, but at this point the trail is a dirt path, well-maintained and easy to follow, with few visitors except for occasional hikers. And it’s not just that we got to see the vistas of the Grand Canyon that we hoped for. As is true in so many other cases, the trail, once removed even just a short distance from where it intersected the bus stops, was basically empty. Until we reached the bottom, we saw no more than a couple dozen hikers along the trail. And the park service has placed picnic tables and benches every few hundred yards along the trail, allowing one to sit and enjoy the beauty of God’s creation in silence and awe. Just one of dozens of picnic tables and benches along the unpaved portions of the Rim Trail, each positioned to allow one to pause for a few moments to gaze over the canyon unfolding below. Incredibly, we had most of the area, including the benches and tables, pretty much to ourselves for three hours. It’s hard to capture the real psychological effect, but that three-hour hike entirely changed our impression of the Grand Canyon. It is definitely one of the most dramatic places on earth, and it inspires a sense of reverence that is unlike anything we experienced elsewhere. 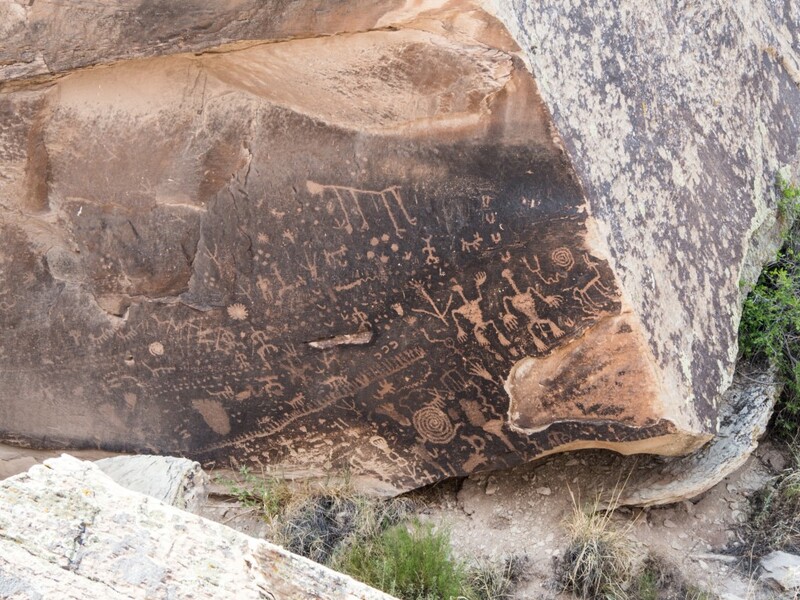 I suppose we still might find the experiences at some of the Utah parks more punchy in a way. 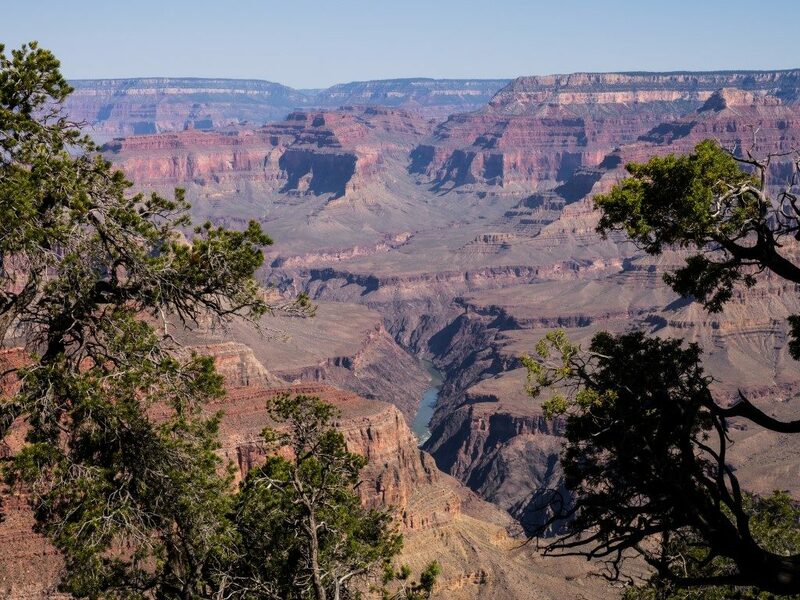 Nothing, for example, can really match the weirdness of the hoodoos at Bryce Canyon or the graceful symmetry of the arches at Arches, but the spiritual qualities of the Grand Canyon will forever hold a special place in our memories of this trip. It is true: “The heavens declare the glory of God; the skies proclaim the work of his hands. Day after day they pour forth speech; night after night they display knowledge. There is no speech or language where their voice is not heard. Their voice goes out into all the earth, their words to the ends of the world.” Amen. We still have one more stop to make at Petrified Forest National Park (we skipped it on the way up), plus a stop to get our windshield fixed (long story), but it’s time to start heading home. This entry was posted in Travels on June 5, 2017 by skiprd. Zion National Park has been something of a mixed bag for us. 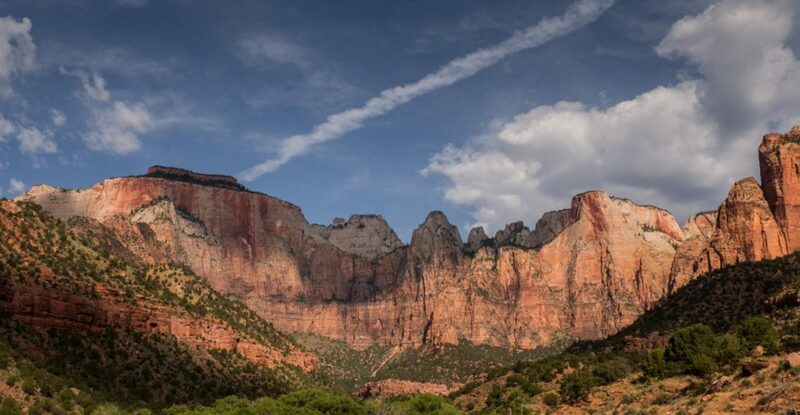 The campground is spectacular (the photo above was taken about 100 yards from our site, looking up at “The Watchman,” which appropriately watches over us every night) and the Zion canyon itself is breathtaking (more on that below). But this place is seriously overloaded and, for the first time in our travels, we’ve had only limited success in figuring out how to negate the effects of the crowds. This wait was only about 15 minutes, even though the line snaked back-and-forth in Disney World fashion for about six circuits. In watching people lining up to get on and off the buses, which often had standing room only, I was reminded of those scenes of commuters being crammed into Tokyo subway cars with giant plungers. The effect of the crowding was compounded by three factors. First is the arrangement of the park itself. As with Arches, the layout of the park is such that there are only a few points in the park where people are dropped off to see the sights. Eight, to be precise, and since cars are banned, it is eight places and only eight places. Second, the number of visitors is more than the park can accommodate. On a recent peak day, the park had 45,000 people in attendance. Essentially all of those people are crammed in and around those precious few eight stopping points. Do the math… it’s not pretty. Finally, being as tactful about this as I can be, there is a problem with the nature of the population. Zion is very close to Las Vegas, so it attracts travelers consisting of a mix of those who are not interested in traveling to any remote location and who, well, are the kind of people who find Las Vegas to be a desirable add-on to their “national park experience.” They all seem to be urban types for whom crowding and density are a necessary corollary to modern life and they are quite good at importing urban “manners” to their visit to the park. And, for them, this probably just another stop on an American vacation itinerary that consists of New York, Chicago, Las Vegas, Zion. That’s the mix. Plus, well over half of the visitors seem to be foreigners who have little knowledge of or interest in conservation of wild places in the American conceptualization of that principle, and therefore seem to have no interest in abiding by the norms of visiting an unspoiled location. But, on the other hand, this place is stunning and once away from the crowds, this place is definitely a must-see. Really. This is as beautiful a location as anywhere we’ve ever been. 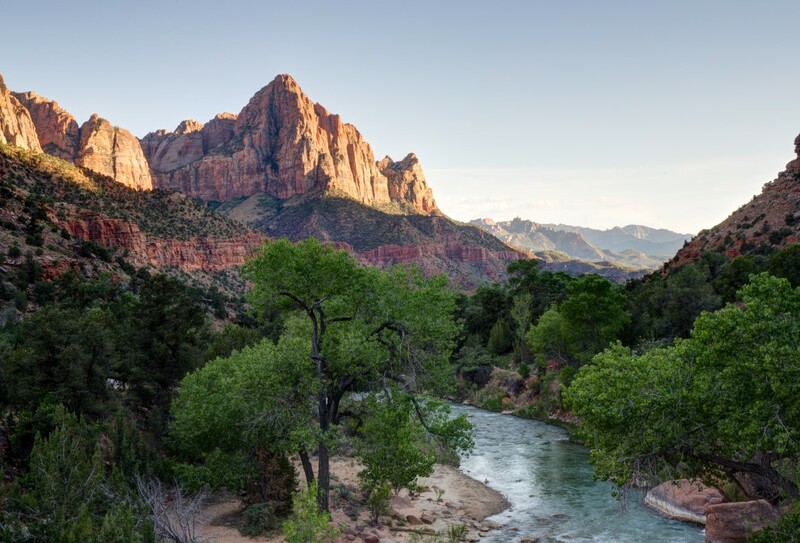 The Watchman, with the Virgin River flowing through the park. By sunset, the crowds were thinning out and it was actually easy to get this shot. The “Towers of the Virgin” as seen on an early morning ranger-guided tour. 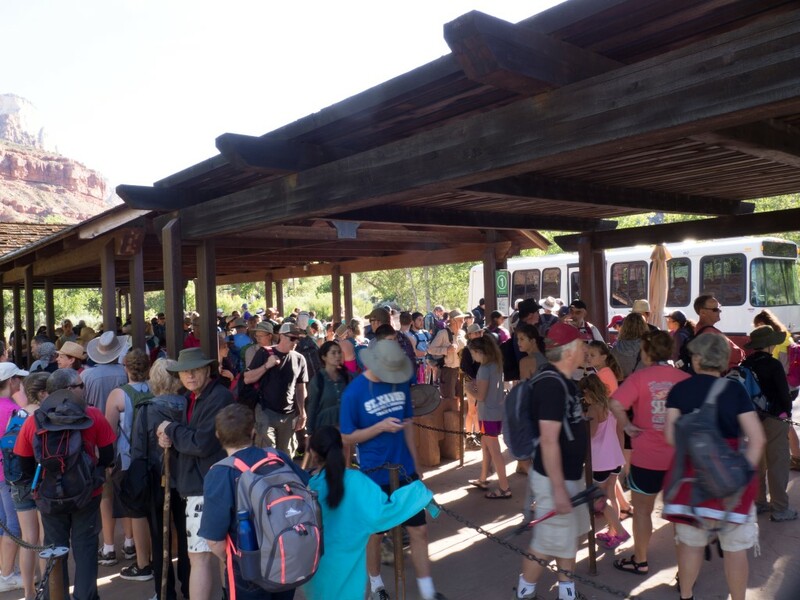 The tour was not only excellent (it focused on the history of the Mormons in this area), because it was (1) early in the morning and (2) a closed group escorted by a ranger, it was free from the crowding that we encountered under other circumstances. And there were times when we got away from the crowds. 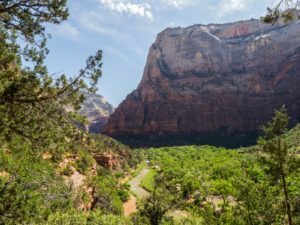 For example, we spent one day visiting Kolob Canyon and Kolob Terraces, two little-visited areas of the park (probably because the roads are so winding and narrow) (and for part of the trip, dirt) that tour buses cannot manage the route. Over the entire trip, we saw maybe a half-dozen people. 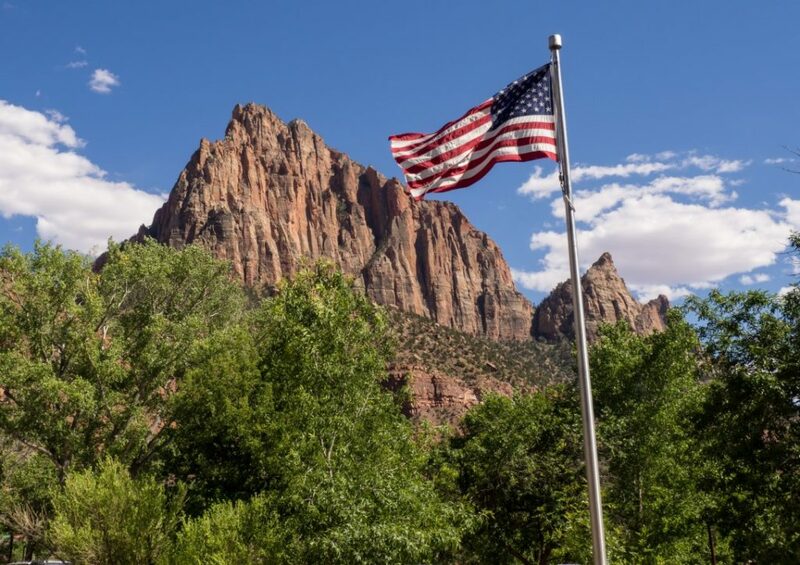 Kolob Canyon. 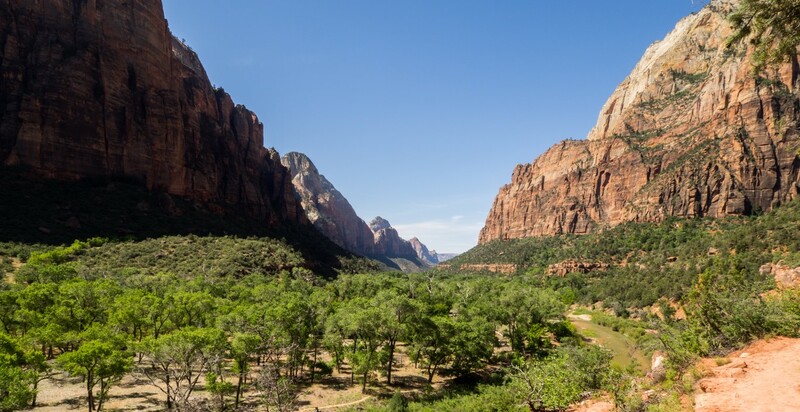 To get here, one has to drive about 20 miles outside of the park, drive north on I-15 for 15 miles, and then take a narrow, winding, marginally terrifying road up through the canyons. But the views are spectacular. On a hike to the “Emerald Pools,” which was fairly jammed with people, we continued on past that photo-worthy spot and, once beyond the location where the selfie-crazed tourists were gathered, the crowds completely dissipated and we had the views to ourselves. 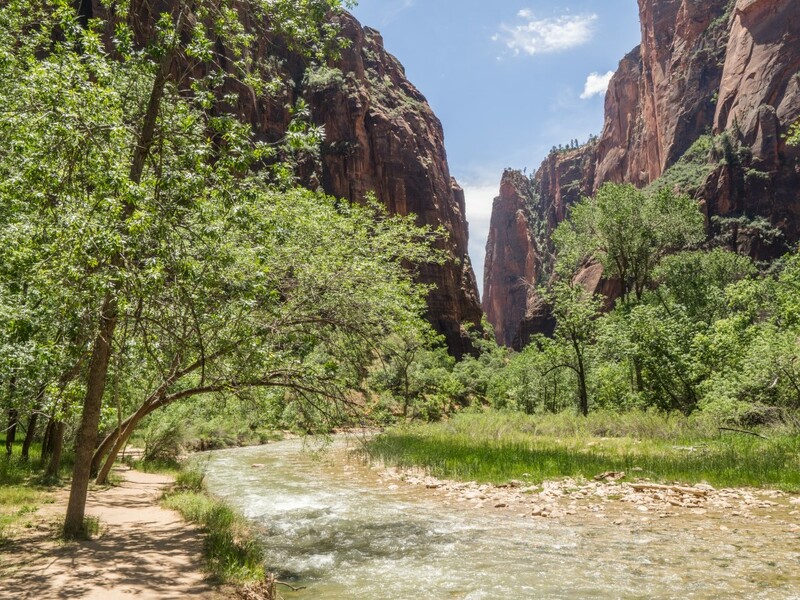 Even on the hateful “River Walk,” Wendy discovered a dirt path next to the river, away from the paved trail up to The Narrows, that was once again people-free. About 100 yards to the left of this tranquil scene are thousands of people, shuffling along in dense crowds, apparently feeling quite at home in the experience but oblivious to the beauty that lies just a few feet away. 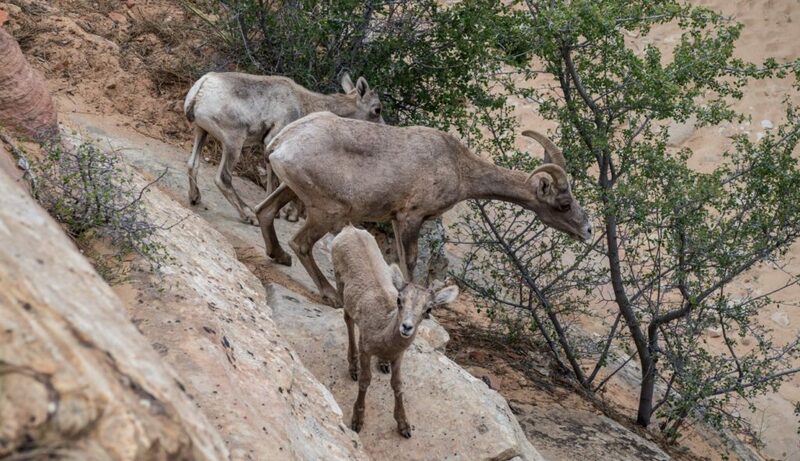 A herd of Bighorn Sheep, all females with a couple lambs. Wendy spotted these as we were driving along, gave the command for an immediate stop and we spent about an hour watching them feeding among the rocks. As the sheep moved off the rocks, this little guy spotted me, apparently wondering why that thing up above him didn’t have horns. We never did see Daddy Bighorn. 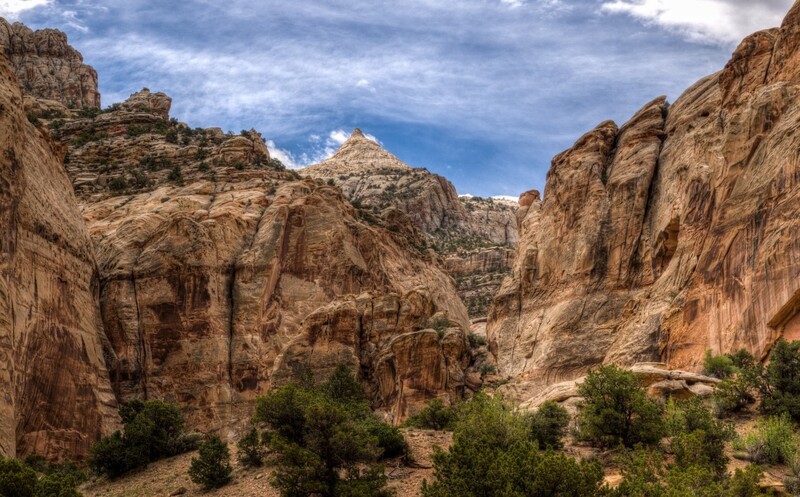 So, of the Utah parks, while this is certainly one of the most beautiful, we’d probably say this was our least favorite. Perhaps it would have been better earlier in the season, or perhaps, unfortunately, this is just the future of the national park experience. This entry was posted in Travels on June 1, 2017 by skiprd. Until we got the Bryce Canyon National Park, Wendy and I thought that Badlands National Park was the weirdest place we’d ever seen. Now, this is the weirdest place we’ve ever seen. 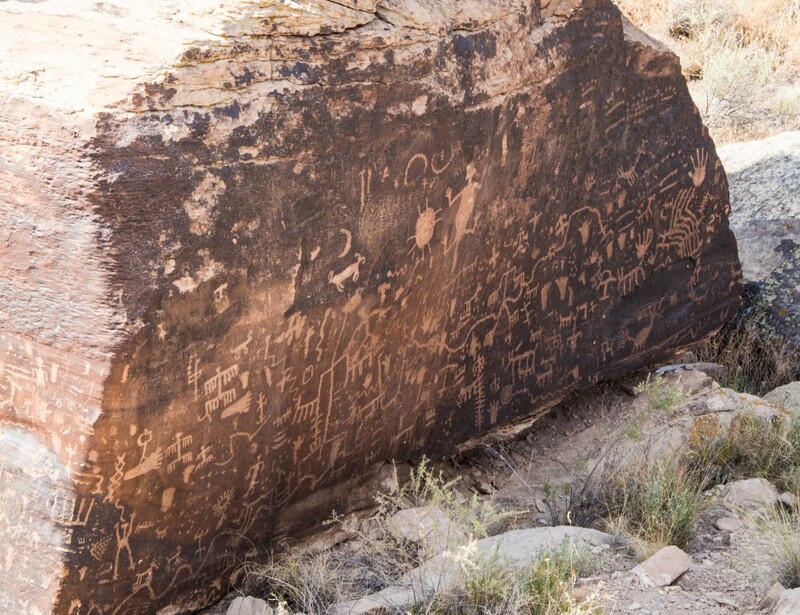 The National Park Service describes the area as a “forest of stone,” and it is exactly that. Mile after mile, thousands of hoodoos, tall rock spires of alternating layers of brilliantly colored rock. I noted in jest that Badlands could be a set for a grade-B science fiction movie, something like Amazon Women from Venus. 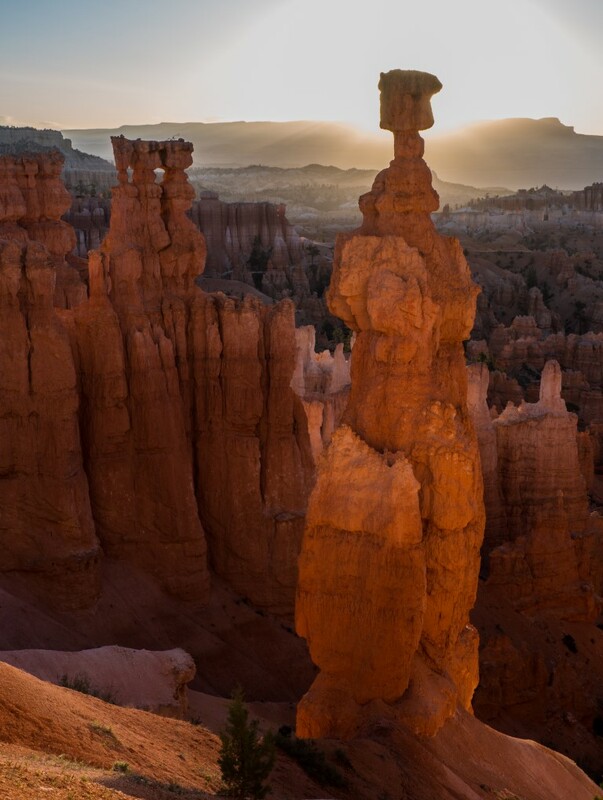 It turns out that areas of hoodoos such as these actually have been used to film grade-B science fiction movies (Space Invaders, I think); that’s how other-worldly is the theatrical effect of these formations. Like the other parks we’ve been to lately, this area is part of the Colorado Plateau, an area of 130,000 square miles that got lifted straight up as a solid block about 7000 feet in a series of uplifts between 65 and 15 million years ago. Then nature started eroding the heck out of the area, apparently with an intent to give us the national parks that have been our stopping points over the past few weeks. 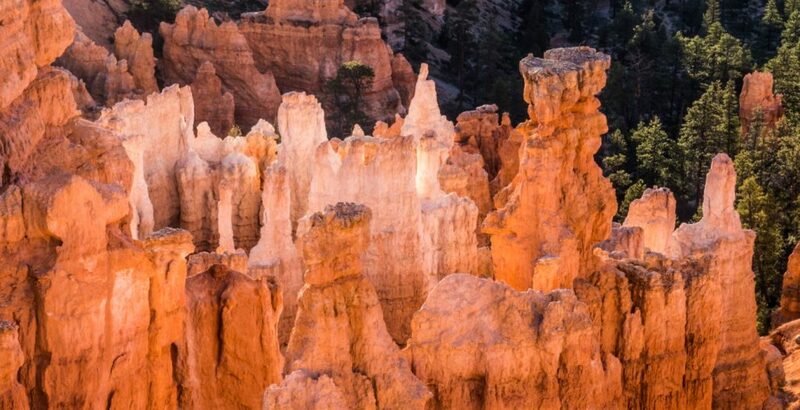 Bryce Canyon got its bizarre appearance because this area was a series of lakes prior to the uplift where layer after layer of plain-old mud got deposited. The upper layer turned into “dolostone,” a kind of mud-based rock that is more resistant to erosion that the limestone mud layers beneath it. So, as erosion occurred, the fractured and broken dolostone protected small columns of underlying limestone as other, unprotected areas eroded away. The result is thousands of spires capped by weather-resistant tops. Different amounts of iron the mud-based rock layers result in the horizontal striations seen in the formations. Walking along the Rim Trail from Bryce Point at the southern end, moving north towards Sunrise Point. A completely gorgeous hike, just like any place out west, with pine-scented forests and cool, crisp air. Ebenezer Bryce was once asked to describe the area and his response, in true, understated, Mormon fashion was, “It’s a hell of a place to lose a cow.” Indeed. At sunrise and sunset, especially if the sky shines in oranges and reds, the whole canyon lights up. In places, the rocks reflect back on each other and it’s as if the rocks are illuminated from within. This is at Sunset Point and, believe it or not, the light wasn’t even that great. But as the sun went down, it would bounce off the rocks, sending light in all directions within the formations, with some formations appearing almost translucent. And if you think these things are weird from the top, you should see them from the bottom! One day we took a hike down into the hoodoo-filled canyon floor, and we were completely awestruck to an equal degree. About half-way down into the canyon on the Queen’s Garden Trail. 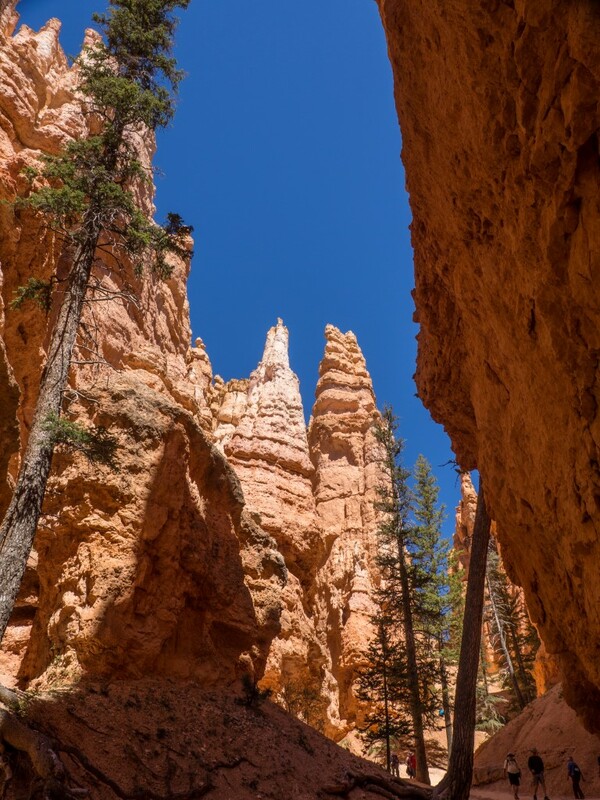 Along the Navajo Loop Trail where one can see how the bases of the hoodoos form deep, twisting canyons. Although the experience at the canyon floor was wonderful, it did present one teensy-weensy, hardly-worth-mentioning problem: we had to get out of the canyon floor. That involved a hike up a trail consisting of 36 switchbacks rising 550 feet. Quite an experience for a couple old geezers! I had to hike down one of the narrow, gravel-covered, winding trails in the dark to get this picture of Thor’s Hammer at sunrise. Don’t tell Wendy, though. She thinks I’m too prone to taking foolish risks and I keep denying it. 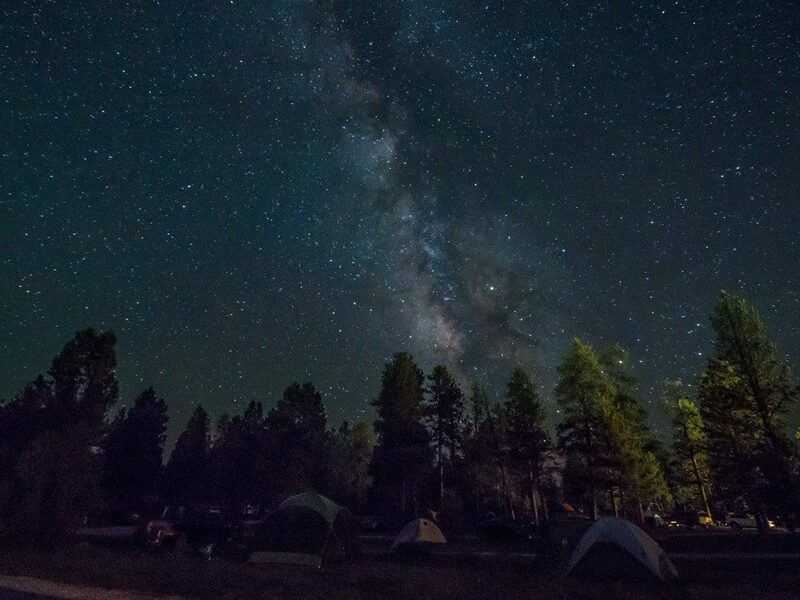 And a shot of the Milky Way over our campground at about 3:00 a.m. Most of the campers here are young families, camping in tents with a terrifying number of toddlers. This entry was posted in Travels on May 29, 2017 by skiprd. OK, traveling around in the west has convinced me that I am definitely going to take some courses in geology. We don’t have geology in the east. We have the Appalachian Mountains, but they’re nothing. Apologists for those mountains claim that millions of years ago the Appalachians were as tall and rugged as the Rockies, but I think they’re just embarrassed by the soft and flabby nature of the Appalachian Mountains so they try to explain away the mountains’ impotence by claiming that the mountains are old. Whatever. And the geology here is fascinating. 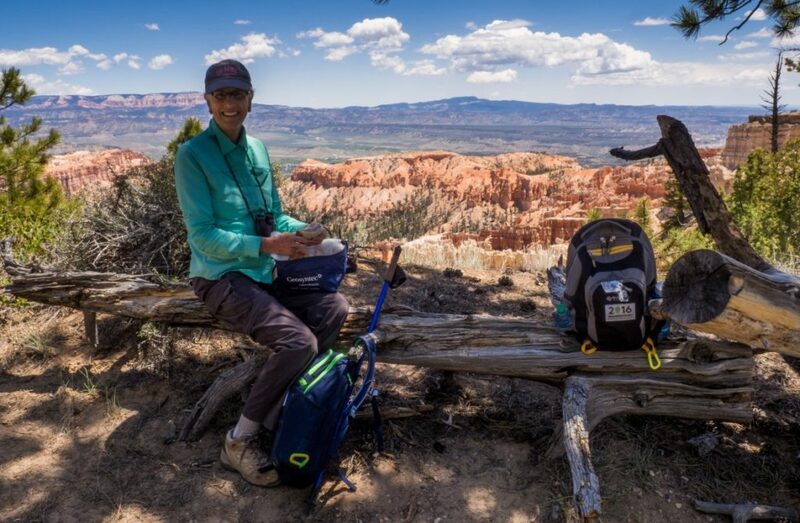 As is our practice, we attended a ranger talk, this one on the geology of the area with the eroded cliffs of the Waterpocket Fold as a backdrop. This was the backdrop for our ranger talk, clearly showing four of the various layers (of a dozen or so) that characterize the Waterpocket Fold. Just one of the many canyons along the 10-mile scenic drive inside the park. Driving up the Capitol Gorge Road. Believe it or not, there’s a road down there. Sometimes, the cliff walls are so close together that the road is barely wide enough for a single car. And until 1962, this was the only road into the area. In the late 19th century, a group of about 10 Mormons settled the area. There was enough water that the Mormons could plant apple, peach, and pear orchards, which still survive to this day. But it’s hard to imagine living here. Mormons must be tough dudes. And, of course, because I’m me, I took off on a five-hour trek down a jeep road (which included intermittent stretches of deep, powdery sand) to get to the Cathedral Valley and snag this picture of the Temple of the Sun. 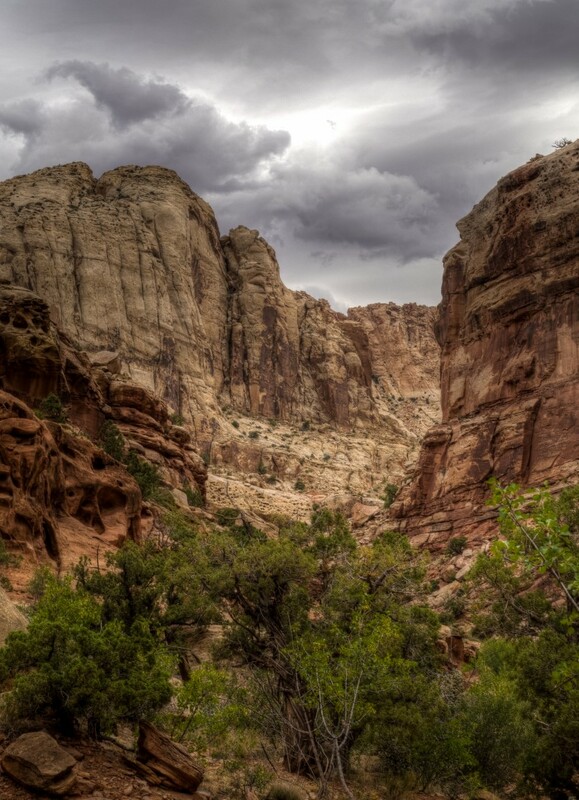 OK, so the geology is fascinating, but unless you’re a geologist, I’m not sure Capitol Reef is a great vacation spot. We sort of felt like we saw all we wanted to see in a day-and-a-half of touring around. Worth it, but not in the same category as Arches and Canyonlands. 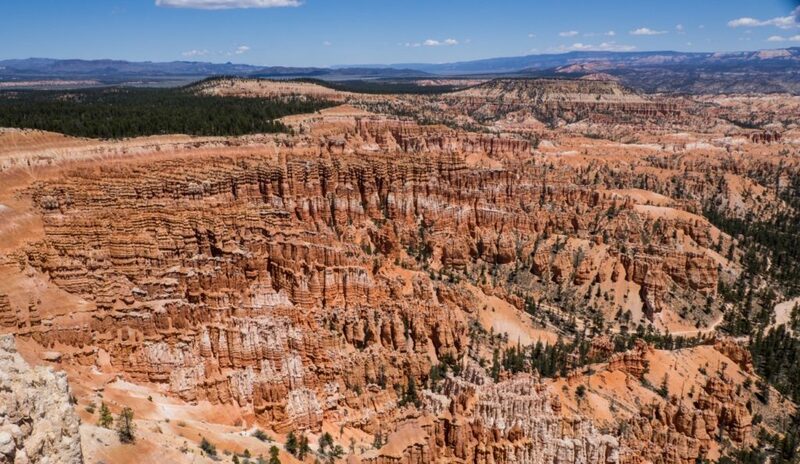 Next stop, Bryce Canyon National Park. This entry was posted in Travels on May 26, 2017 by skiprd. 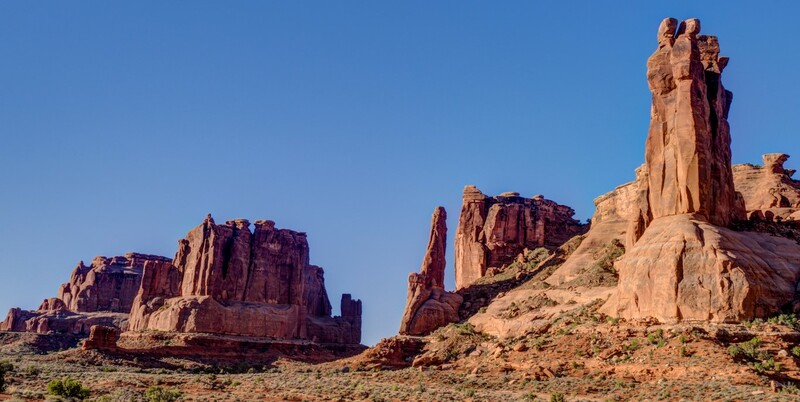 The Islands in the Sky District of Canyonlands National Park is only 13 miles as the crow flies from Arches National Park, but it might as well be 1300 miles. It defies description how two places so close together can be so different. 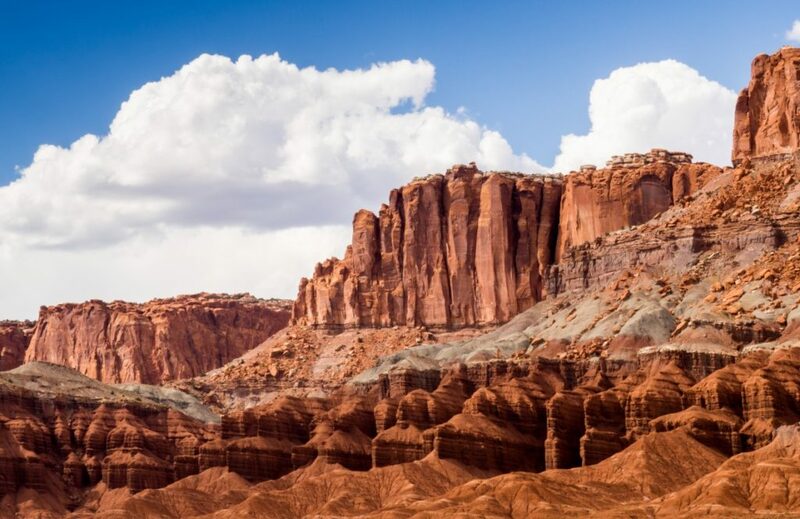 Whereas Arches whacks you in the face with towering, unlikely formations of rock that rise straight up from the surrounding terrain, Canyonlands overwhelms you with deep, unlikely canyons that drop straight down from the surrounding terrain. 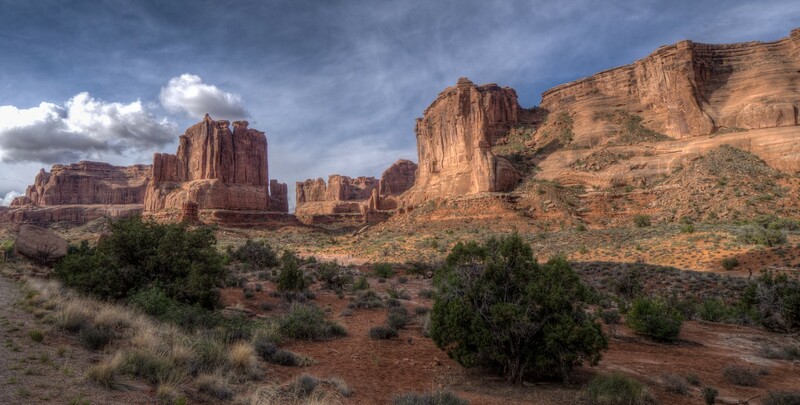 Arches is an area of specific, localized monuments to the forces of nature; Canyons is an area of vast, endless vistas that testify to the forces of nature. The two places are equal but opposite testaments to nature’s inexorable constructive and destructive forces relentlessly applied to the earth’s surface. The Canyonlands plateau is an area within the Colorado plateau, the latter encompassing 130,000 square miles of land generally located in the four corners area of Colorado, Utah, Arizona, and New Mexico. 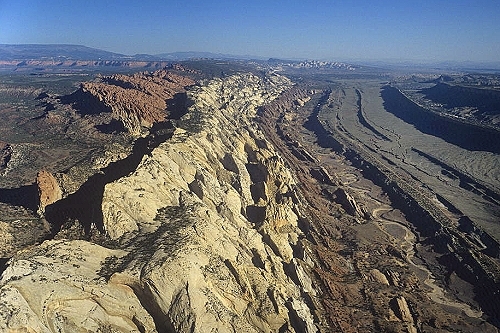 While the Pacific and North American plates pushed against each other, one sliding over the other at about two inches per year, and crinkled up the surface of the earth to form the Rocky Mountains, that same movement actually lifted the four corners area straight up as a huge plateau. (I know, I know — how can one lift up a piece of rock 130,000 square miles big and tens of thousands of feet deep? That’s just one of an infinity of incomprehensible realities in this area.) Then, just as nature created the expansive, flat area, it began wearing it down. The top 4000 feet of the plateau has already been worn completely away by water and wind. Where rivers flow through the area, they wear it down even further. Here in Canyonlands, the river canyons are about 1400 feet deep. 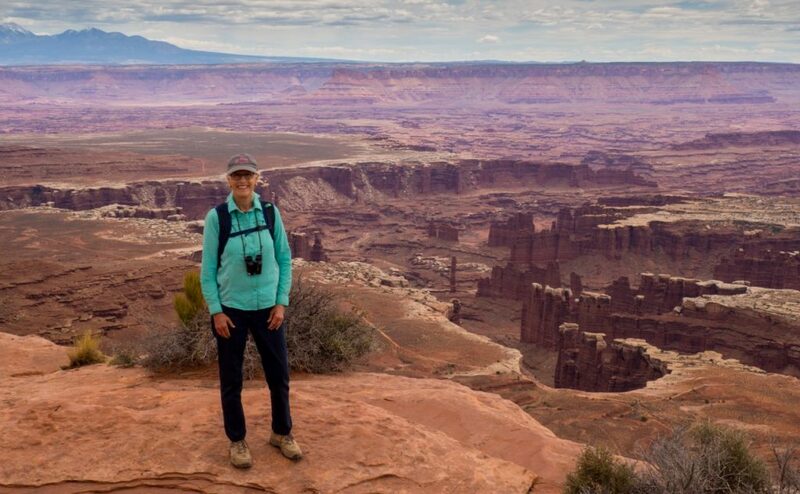 This picture was actually taken at Dead Horse Point State Park, which abuts Canyonlands. 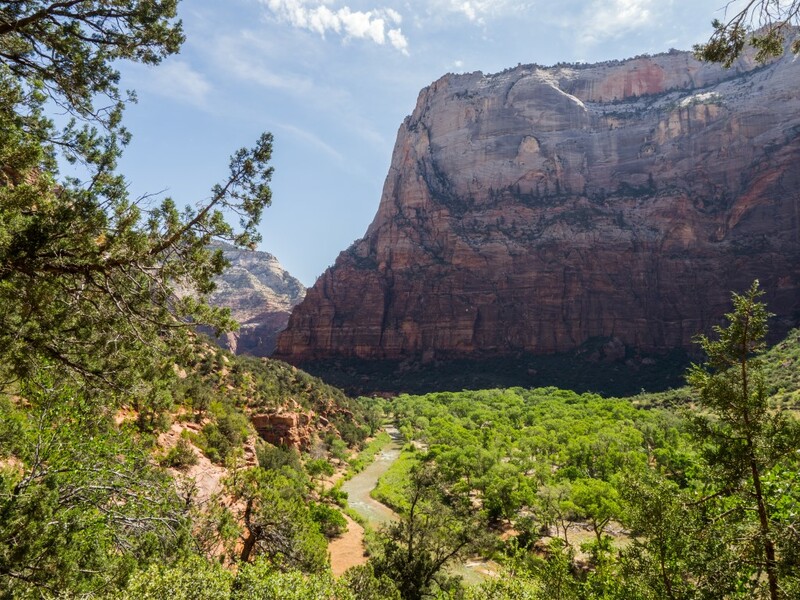 The park has actually been used in many movies as a surrogate for the Grand Canyon because (1) filming here is easier than on federal land and (2) at least in the eyes of the State of Utah, it’s actually more beautiful. Utah formed the first “film commission” in the United States back in the early 20th century and has gone out of its way to accommodate the movie industry ever since. We spent several days here, not nearly enough time, and did our usual activities: hikes, picnics, and ranger talks. As we were doing all that, completely enjoying everything about this place, we wondered whether this park would be a good place to bring young children. Definitely not. 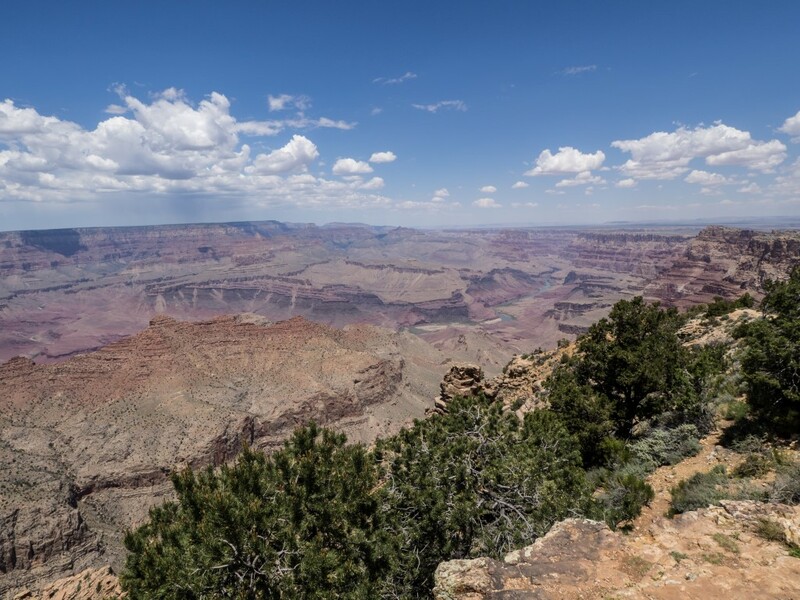 There are far too many precipitous drop-offs and even a moment of inattention could have tragic consequences, although in reality a child would hit a ledge about 400 feet down rather than dropping all the way to the canyon floor. Still, for most parents, that difference probably wouldn’t matter. One hike worth noting was to Upheaval Dome. Scientists don’t know if this crater with strange green rock in the middle represents a collapsed salt dome or the impact of a huge meteor, although the latter possibility is the current favorite. If it were a meteor, it hit 25 million years, was 1/3 of a mile wide, and hit the ground with the force of a nuclear explosion. Now that would be fun. We also lucked out and stumbled into an evening “star party” hosted jointly by rangers from Arches, Canyonlands, and Dead Horse Point State Park. The rangers brought six telescopes, enough that the 50 or so people in attendance were not hurried at all. We saw Jupiter, including that “storm” (like a hurricane, I’m told) that’s been raging for 300 years, the “ring nebula” (the circle of dust and gas left over when a star exploded! ), and (my favorite) a spiral galaxy. And, of course, because the skies are so dark and the air is so clear, we were treated to the sight of the Milky Way rising before us. And I was able to get up at 3:00 a.m., again, actually for the third time in the past week, to travel off to a special photo location and snag a picture of sunrise at Mesa Arch. That shot is something of an icon for the park, and is on the bucket list of most serious photographers. One of the classic, iconic views of sunrise at Canyonlands as seen through Mesa Arch, with the Colorado River canyon and several spires visible in the background. I arrived at the arch at 4:50 a.m., over an hour before sunrise. There were already six photographers lined up, tripod-to-tripod, when I got there. At T-minus-30 minutes, the number had grown to about 30. And then, believe it or not, a tour bus of 30 Asian photographers showed up, which made for quite an experience when the sun finally popped up, with dozens of shutters all clicking in rapid succession. 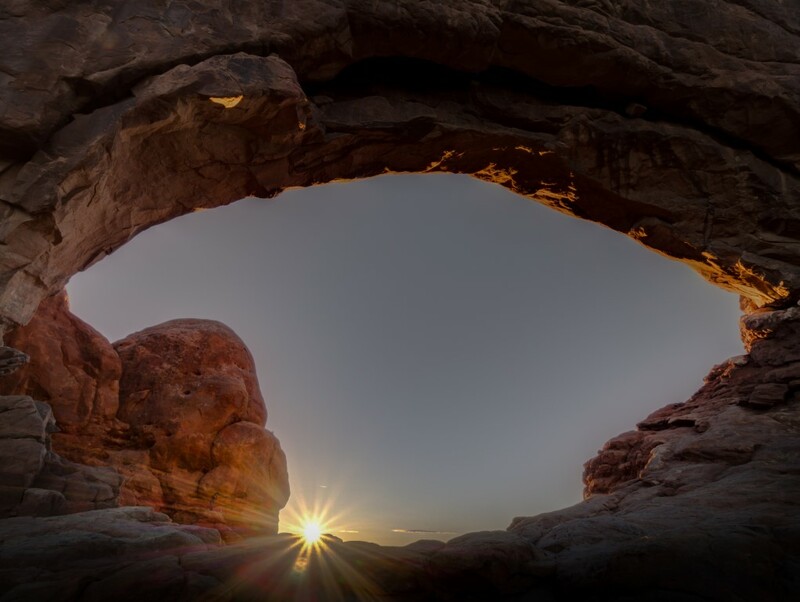 In any event, more pictures of the Mesa Arch sunrise are on the photo albums page. We ran out of time and did not get to do all of the hikes on the list of recommendations, and we didn’t get to see the other two units of the park at all. But still, this was a dramatic and unforgettable place. 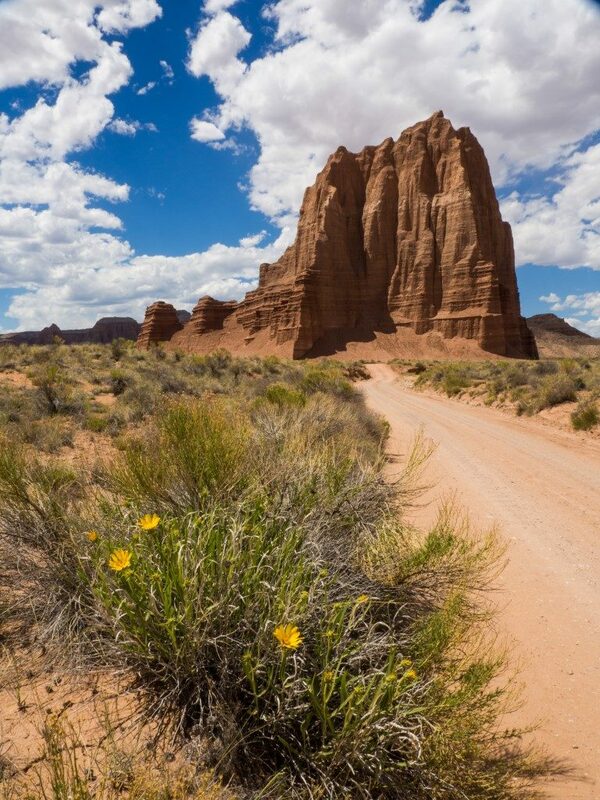 Next stop, Capitol Reef National Park. This entry was posted in Travels on May 24, 2017 by skiprd. First, the good news. Despite the challenges faced by the park, as described below, not a bit of that detracted from our experience here in the slightest. This place is wonderful. 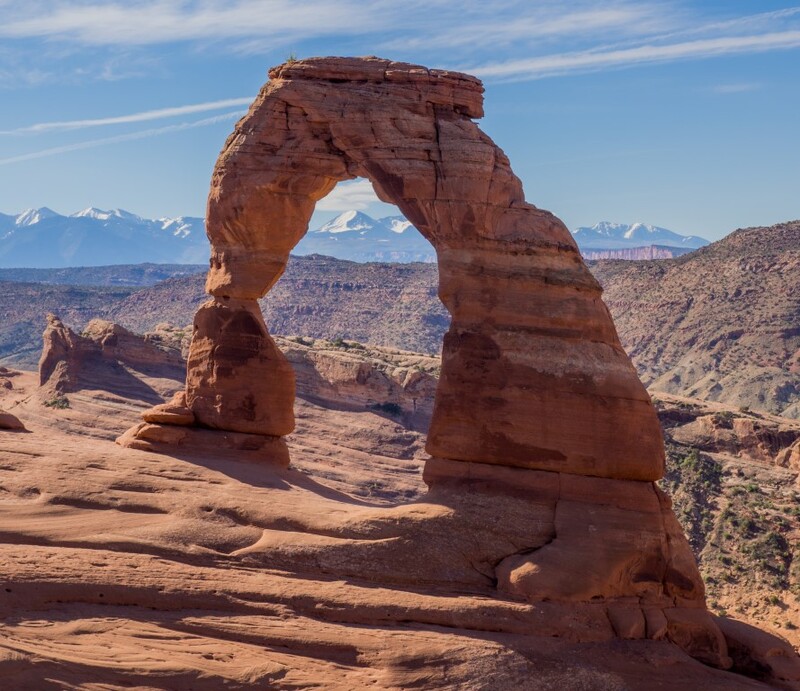 Delicate Arch, the iconic symbol for Arches National Park. 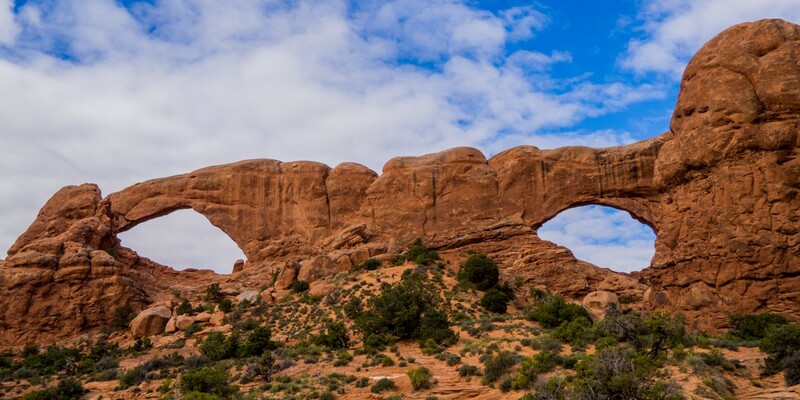 And the very same arch that appears on Utah license plates as the symbol for Utah. And probably the one arch that comes to mind for everyone when they think of this park, whether they’ve been here or not. So we spent several days just exploring this fascinating little area of bizarre geology. “The Windows,” a pair of arches. On the South Window (the one to the right), you can plainly see a layer of rock that’s been worn away and that is different than the layers above and below it. Turret Arch. Note that area being worn away just to the left of the hole. That’s an arch in progress. Come back in a few million years, and there will be an arch there, although the span over the current arch may be gone. You get the idea. But it’s not just arches. It seems that everywhere one turns, there’s another oddity caused by erosion in this area of particularly malleable layers of different kinds of rock. Seriously? This is called “Balanced Rock,” but while it may be balanced now, I’m pretty sure that in the blink of a geological eye, that sucker is coming down. And sometimes this place is just unspeakably beautiful. And, because I’m me, I did do my thing of getting up at 3:00 a.m. one morning and running over to get a shot of one of the arches (the North Window in this case) at sunrise. They’re not visible in this photograph, but just before sunrise about six or eight people wandered up, most of them not even photographers, and sat here at the arch just to watch the magic of the rocks turning bright orange as the sun climbed above the horizon. So we had a great time at this strange and beautiful place. We did several hikes, attended a really great ranger-guided walk, all had several picnics, all the usual things, just in a place that is anything but usual. But now for the bad news. Arches National Park is seriously overloaded. I mean like clogged-up, choking-on-itself, loved-to-death overloaded. 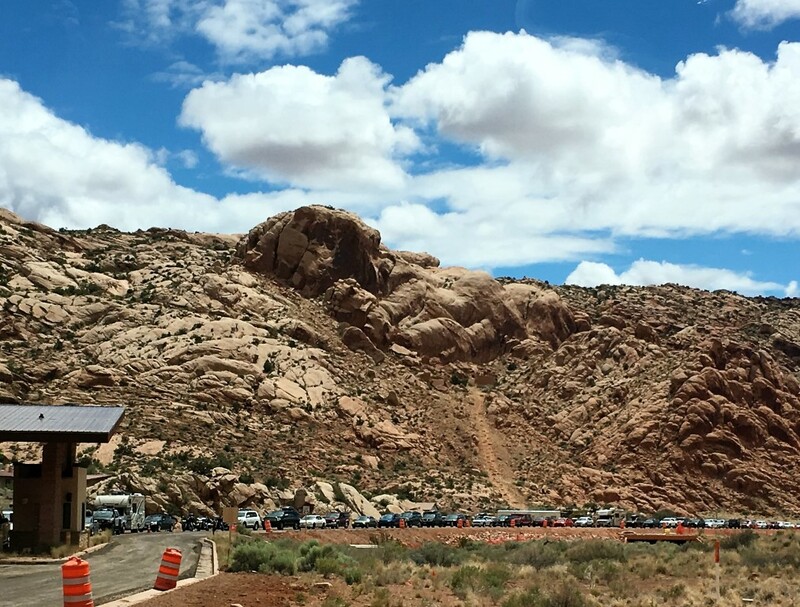 A L-O-N-G line of cars, nearly backing up onto US-191, waiting to get into Arches, and this was on a weekday. I bet it took an hour to get to the entrance station. The problem isn’t the number of visitors, at least not in an absolute sense. 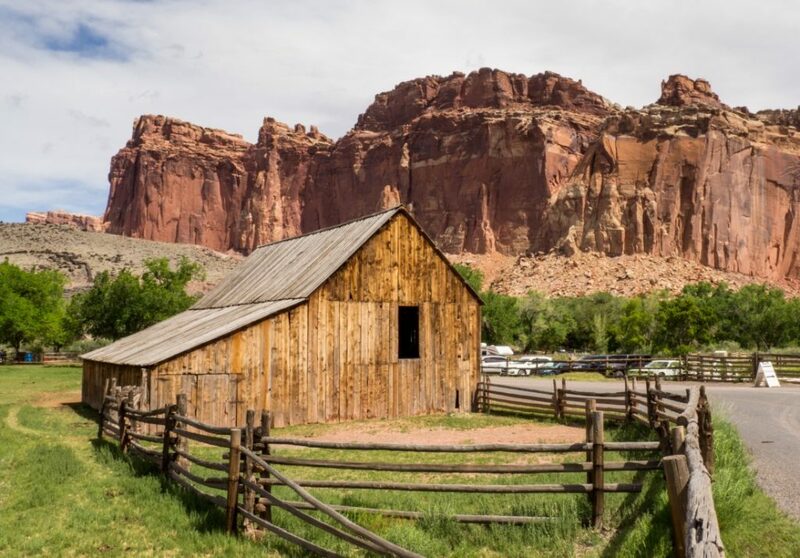 Last year, Arches had about 1.6 million visitors, which isn’t large compared to other western parks like Grand Canyon (6.0 million visitors), Yellowstone (4.3 million), Grand Tetons (3.3 million), or even Glacier (2.9 million). The problem, at least as it appears to me, is that there are darn few places for those 1.6 million people to go. The result is that they congregate at a few locations, overwhelming the parking lots, turning the trails into something like urban sidewalks, and destroying the wildness of the place that presumably most of the visitors came to experience. 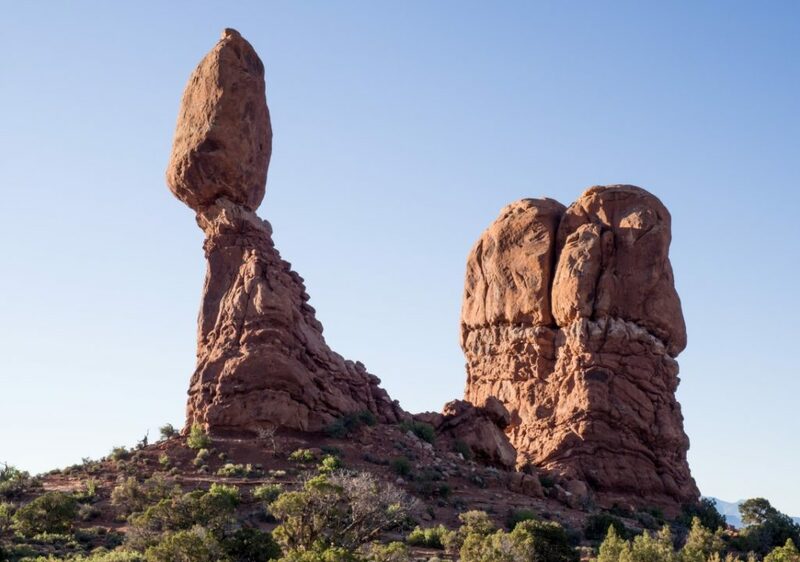 And the effect is compounded here by three factors: First, Arches is rebuilding its entire road network, and the park was closed Sunday through Thursday from 7:00 pm to 7:00 am. The upper end of the park, including the area around the famous Landscape Arch, is closed entirely. Second, there is a surplus of rental Class-C motorhomes like we have never seen. Hundreds, maybe thousands of them. And because the RV parking spaces are often filled with cars who couldn’t find anywhere else to park, the RVs park in the car areas, taking up 3 or 4 spaces, and the whole thing is a vicious circle. Finally, there seems to an unusual number of tour buses. At the Windows/Turret arches area, for example, there were FOUR (that’s right, count ’em, four) tour buses dumping people into a teeny, 100-yard path to the overlook. Plus, most of them were French, which made a bad situation even worse. I understand that NPS is currently considering a management plan under which people, at least groups of people, will have to stake out a reservation slot to enter the park. That’s a terrible solution, but maybe better than the current situation. As I said at the outset, the crowds weren’t really a problem for us and didn’t interfere with our enjoyment of the place. We usually get to where we going early in the day, and we head into the back country where there are fewer people. (Although here, perhaps due to a higher-than-normal proportion of fit, young people (dang them), even the trails had more people than we’re used to seeing. But, as you can see from my pictures, I was always able to capture the scene I wanted with no people in the frame, so things were never that bad.) So, it was a great stop for us despite the crowds. Combined with our excursions to Canyonlands (see the accompanying post), we’ll remember this place for a long time.